My husband loves indian food. Its not one of my favorite things to cook but I do feel such a sense of accomplishment when I do and it turns out. This past weekend, I made for the first time, kuku paka – chicken in a coconut curry sauce. 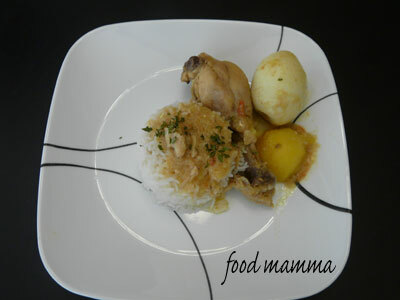 Chicken, tender potatoes and boiled eggs in a creamy yet mild curry – yum! This was a hit with both husband and Q….definitely a make again meal. Mix together the onions, chicken, tomatoes and spices and cook for a few minutes on medium heat. Add the potatoes and water and cook on medium heat until chicken is done. Add the coconut and continue cooking until the curry has reduced. Add eggs. Garnish with parsley or coriander. Enjoy!